A WEALTH OF EXPERIENCES OPENS A WORLD OF KNOWLEDGE. It is our mission to engage young children in direct and meaningful experiences with the natural world and other people. We encourage questions and exploration. We invite free expression through language, song, drama, art, play and invention at all levels. We value individuality and also teach respect for others. We are professionals, deeply committed to helping your child learn and grow. Here, we believe that a high quality education starts with high quality teachers, so all of our head teachers have college degrees in Early Childhood Education. Lindgren teachers take pride in teaching here, and most have been with us for more than 15 years. The teachers share their incredible talents and interests with the whole school: playing guitar and singing, live storytelling, drama and skit work, yoga, gardening, natural sciences, animal husbandry, fine arts, ceramics, puppet building, sewing, baking and cooking. All the teachers share the Lindgren mission and philosophy. Teachers model, instruct, guide, describe and question as the children play, so that the children learn important social skills, new vocabulary, and expand their development. Teacher-led activities are designed to develop specific skills or concepts: Math games are used to teach number recognition, counting and comparing skills, addition and subtraction, and pattern making. Creating books invites children to tell stories meaningful to them. Art activities provide many opportunities to learn about shapes, practice using writing and drawing tools correctly, explore geometric relationships, find out about cause and effect, learn to cut with scissors, and represent ideas. As the children draw and talk, they are learning important early literacy skills and see that what they say can be written and read by someone else. We welcome diversity; the children attending Lindgren come from a wide range of cultural and ethnic backgrounds. Our families come from Bergen County, Rockland County, and New York City. Our families become part of a shared community interested in providing a natural childhood and a quality education. Inside our main cottage-style schoolhouse, we have five large, sunny, ground-floor classrooms, bordered by windows to let in natural light. For toddlers, we have a separate cottage with two classrooms. Each classroom has its own entrance, bathroom facilities and easy access to the outdoors. The classrooms have beautiful wooden furniture, bright woven area rugs and handsome toys, blocks, and puzzles made of natural materials. Children have access to materials at their own level. The tables and chairs, sinks, and equipment are scaled to their size. Our daily program is designed to nourish a young child's innate interest and imagination while developing the mind, feelings, physical body, and social skills needed for life. We feel that free play is essential for learning; there is a dedicated time every morning and afternoon for free play. During free play, children interact with materials that allow experimentation and invention. They discover possibilities and explore new relationships between people, ideas, language, and physical laws. Library/Literary Area — Children are free to share books. We take great pride in our collection of handsome, beautifully illustrated books for children, many of them award-winning classics. We avoid all commercial books that are based solely on TV or movie characters, instead choosing lovely stories and tales from around the world. Science Area — Natural objects, plants, minerals, and animals can be observed and studied, like observing the Monarch butterfly from egg, to larva, to chrysalis, to butterfly, and then setting it free for its journey to Mexico. We observe insects and parts of plants through a magnifying glass or a microscope. Each season, we take a hike through the nature center to observe the changes. Technology — We embrace engineering technology, such as physics, building, designing, and experimenting. We do not believe that pre-school is the place for TVs, tablets, or computers. Our classrooms are screen-free to allow children to interact directly with their world. Block Building — A skyscraper can be built in a morning, if the engineers and builders are working together. Important mathematical and physical laws are discovered, like measurement, gravity, and stability, and cooperative invention and building are fostered. Table Manipulatives — Individuals and small groups work with puzzles, LEGOS®, pattern blocks, unit cubes, and building sets. All are designed to encourage small motor development, experimentation, planning ahead, and completion. We play educational card games that require memorizing, predicting, and strategizing. Other objects are provided to encourage counting, sorting, measuring, and comparing. 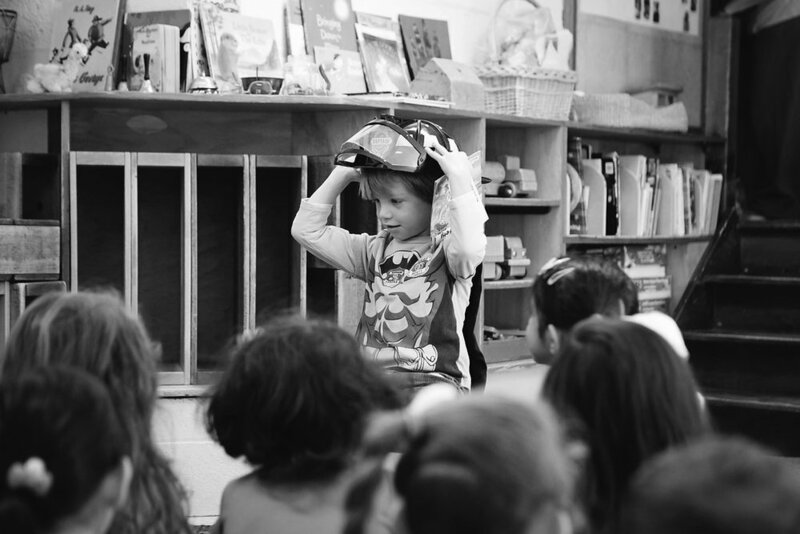 Dramatic Play — Children dress up, role play, and recreate social dramas, pretending to be moms, dads, babies, storeowners, policemen, cats with kittens, tigers and dogs. The list goes on. Water Table — The dynamics of a liquid can be freely explored: pouring, overflowing, absorption, measuring, stirring, squirting, floating and sinking. Arts Tables — Traditional art forms from around the world are offered every day in each class. Painting in watercolors and tempera, oil pastels, printmaking, paper maché, stitchery, beading, batik, ceramics, felting, and book making are just some of the media that we offer. Of course the children always have paper, crayons, markers, scissors, tape, and glue accessible for use during Free Play. Rug Area — Children and teachers gather for Circle Time — a structured teacher-led time for developing skills such as sitting attentively and quietly, listening, taking turns to share thoughts and ideas, and better recalling and inferring the content from books and stories. At Circle Time they can hear a story, read a book, sing songs, play rhyming and rhythm games, act out a play, discuss life, resolve problems, and share family news and treasured items. Outdoors — We go out every day, because it’s a rich source of hands-on, multisensory stimulation, which is critical to brain development in early childhood. Time spent in nature has also been shown to reduce stress and increase attention spans—making children better learners. Hot, cold, snowy, sunny, misty—in all but the worst weather we make nature a learning opportunity. Lindgren Nursery School is for all pre-kindergarten children, ages 2½ to 5. Each class has a team of two teachers responsible for the daily program. The daily schedule for all of our classes is fairly similar. SPECIAL ACTIVITIES are offered in the afternoons — yoga, singing, gardening, and art classes of clay, stitchery, and weaving. 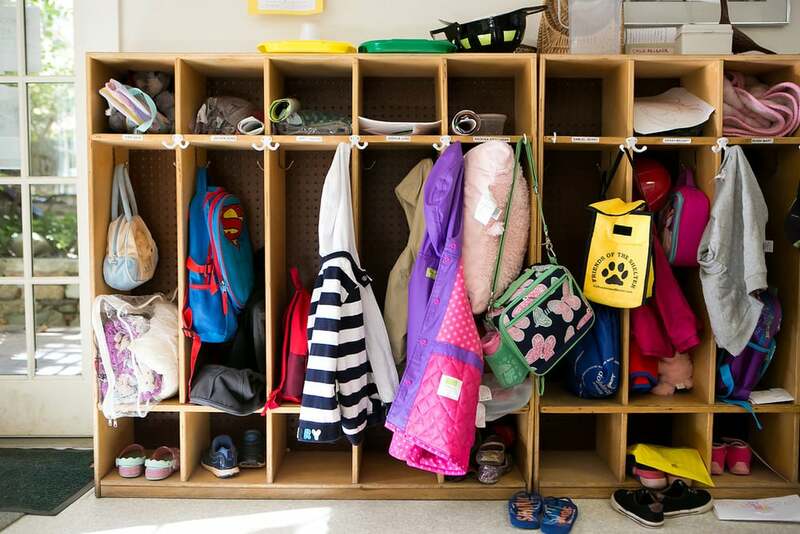 We offer childcare before school from 7:30AM, and after school until 5:30PM for an additional hourly fee. We also offer care during the February and April vacations, and the 2½ weeks between the last day of school and the first day of camp. At Lindgren we promote healthy eating. We provide daily midday snacks of crackers, pretzels, chips, fresh and dried fruit, vegetables, cheeses, etc. Teachers cook and bake with the children sometimes using our own fresh eggs, herbs and vegetables. We always offer water, as many children cannot tolerate juice or milk. Nut products are allowed, but restricted in classes where students have allergies. We can accommodate allergies by class, so those learning together can enjoy the same snack. We are located at 211 Irving Ave., Closter, NJ. If you are driving your child, we’re only 10 minutes from the George Washington Bridge. Busing is available to and from most local towns for an additional fee. We offer an orientation session the day before classes begin. This is an opportunity for parents and children to meet teachers and other students, and see the classrooms and playground first-hand. Parent-teacher conferences are held for two days in January, though parents and teachers are encouraged to arrange a conference any time there is a need. Parents are welcome in the classroom at any time if they wish to observe, or join us in cultural celebrations, or share their own interests or talents with the children. All visitors must check in at the office first, and bringing a special activity to share should be arranged with the teachers. We’ve had wonderful visits from parents who were policemen, firemen, dentists, violinists, pianists, clarinetists, opera singers, and pastry chefs. Parents have also joined their child’s class to celebrate Rosh Hashanah, Lunar New Year, Diwali, Japanese Children’s Day, Cinco de Mayo, Hanukkah, and Greek Easter, just to name a few. These are opportunities for the children to share their school with their whole family. Back-to-School Potluck Supper. Dishes brought in by parents represent many countries and cultural traditions along with American favorites. This is a great time to meet other families and all the teachers. Holiday Craft Fair. Each December local artisans, including parents, join us to sell art, pottery, handcrafted items, and homemade delicacies. Lindgren offers hot and cold beverages and baked goods. Winter Wonderland Lantern Walk & Soup Supper. As the sun sets, lantern in hand, parents and children are led by a naturalist for a walk through the Nature Center. Warm soup and bread await our return. Spring Picnic. Parents visit the classroom to see their children’s artwork, and each family brings food for a picnic while the children play.